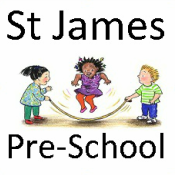 At St James Pre-School we plan and organise our systems to ensure that every child receives an enjoyable and challenging learning and development experience that is tailored to meet their individual needs. The fees are £13.50 per session. Fees must still be paid if children are absent due to illness or holiday. If you decide to withdraw your child from Pre-School, we would appreciate one month’s notice. During the period of notice, your child can still attend Pre-School and normal daily fees will apply. If you withdraw your child and cannot give notice, one months fees will be payable. An annual charge of £75.00 to cover administration costs is payable for each child. This may be paid in three instalments of £25 at the beginning of each term. For your child to keep his/her place at the setting, you must pay the fees. We are in receipt of nursery education funding for three and four year olds; funding becomes available during the term following your child’s third birthday. Where funding is not received, then fees apply. Funding may also be available for two year old children whose family meet certain criteria. If you require further information regarding any aspect of fees, please speak to the Leader or Assistant Leader who will be happy to help or you can use the links below. The Key Person role is set out in the Welfare Requirements of the Early Years Foundation Stage. Each Setting must offer a key person for each child. The key person's role is to work closely with your child and monitor and record children's progress and development, relaying this information back to you on a regular basis. This helps the Pre-School to promote positive relationships with both the child and their family. The provision for children’s development and learning is guided by the Early Years Foundation Stage framework issued by the Department for Education and Skills. We provide care and education for children between the ages of 2.5 - 5 years. Physical Development involves providing opportunities for young children to be active and interactive; and to develop their coordination, control and movement. Children must also be helped to understand the importance of physical activity, and to make healthy choices in relation to food. Literacy involves encouraging children to link sounds and letters and to begin to read and write. Children must be able to access to a wide range of reading materials (books, poems and other written materials) to ignite their interests. Mathematics involves providing children with opportunities to develop and improve their skills in counting understanding and using numbers, calculating and simple addition and subtraction problems and to describe shape, space and measures. Expressive Arts and Design involves enabling children to explore and play with a wide range of media and materials as well as providing opportunities and encouragement for sharing their thoughts, ideas and feelings through a variety of activities in art, music, movement, dance, role-play, and design and technology. The setting keeps a learning journey file for each child. Staff and parents can contribute to the child's learning journey file and assessment scales. This is one of the ways in which the key person and parents work in partnership. Your child’s learning journey file helps us to celebrate together his/her achievements and to work together to provide what your child needs for his/her well-being and to make progress. We organise our sessions so that the children can choose from – and work at – a range of activities and in doing so, build up their ability to select and work through a task to its completion. The children are also helped and encouraged to take part in a balance of adult-led, child initiated, small and large group activities which introduce them to new experiences and help them to gain new skills, as well as helping them to learn to work with others. The setting makes snacks a social time at which children eat together. We plan the menus for snacks so that they provide the children with healthy and nutritious seasonal fruits, vegetables and cereals. Do tell us about your child’s dietary needs and we will make sure that these are met. On occasion the children may take part in other activities relating to food for example food tasting sessions and cultural celebrations such as Chinese New Year, Pancake day, Christmas parties and World Food day. Copies of the setting’s policies and procedures are available on request. The setting’s policies help us to make sure that the service provided by the setting is a high quality one and that being a member of the setting is an enjoyable and beneficial experience for each child and his/her parents. The staff and the governing body of the setting work together to adopt the policies and they all have the opportunity to take part in the annual review of the policies. This review helps us to make sure that the policies are enabling the setting to provide a quality service for its members and the local community. Various policies are available on the 'More' section of the website. Our setting has a duty under the law to help safeguard children against suspected or actual significant harm or neglect. Our strict employment practices ensure children are protected against the likelihood of abuse in our setting and we have a procedure for managing complaints or allegations against a member of staff. Our way of working with children and their parents ensures we are aware of any problems that may emerge and can offer support including referral to appropriate agencies when necessary to help families in difficulty. As part of the setting’s policy to make sure that its provision meets the needs of each individual child, we take account of any additional needs a child may have. The setting works to the requirements of the 1993 Education Act and the Special educational needs and Disabilities Code of Practice (2014).Please speak to our SEND coordinator if you wish to discuss any of your child's care needs. Policies relevant to Special Educational Needs, Disability and Inclusion are available on the 'More' Section of the website.